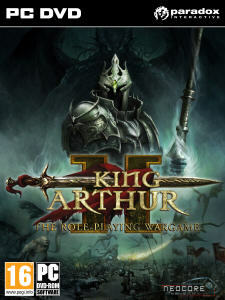 In this Preview we will speak about the upcoming strategy game on PC entitled King Arthur II: The Role-playing Wargame. It is a few weeks left till the release, and we have already experienced the Prologue campaign of the game, which will be available for Pre-Orders. Hungarian team at Neocore (NeocoreGames) right from the beginning has focused all its activities on making strategy games for PC. 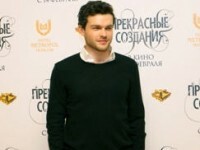 The core team already includes around 30 people, but, nevertheless, they know a lot about interactive intertainment. While considering the favorite features of the genre, this developer always looks for something innovative to implement, and it works. 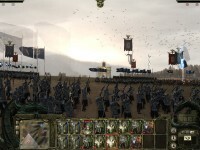 Through the past six years the studio managed to release three ambitious projects, as well as a series of expansion to its flagship title – King Arthur: The Role-playing Wargame (2009). When we first became acquainted with the latter, it felt like getting back to the classical canons of Master of Magic (1994), but raised up to all the modern standards, and wisely enhanced by new ideas. The universe of Celtic myths and legends featuring king Arthur Pendragon proved to be a great fantasy story foundation. Just as the legends of Camelot can not live without Camelot, Guinevere, Knights of the Round Table, the sage Merlin and the Excalibur sword a good script couldn’t exist without involving a player into it heavily. It is pleasant to visit this fabulous world again in an upcoming sequel – King Arthur II: The Role-playing Wargame (2012), which is coming out on the 10th of January, 2012, and it is one of the most anticipated games for us next year. 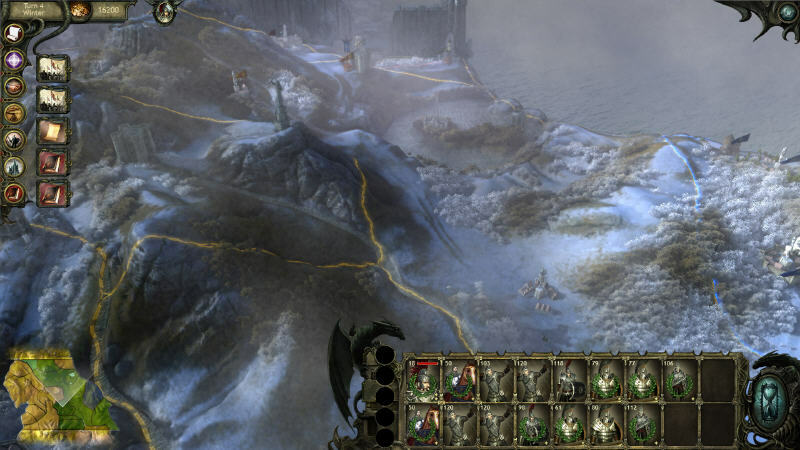 For the first part of the game its developers have already released two DLC packs named Knights and Vassals and Legendary Artifacts respectively, followed by two major expansions – The Saxons (2010) and The Druids (2011). 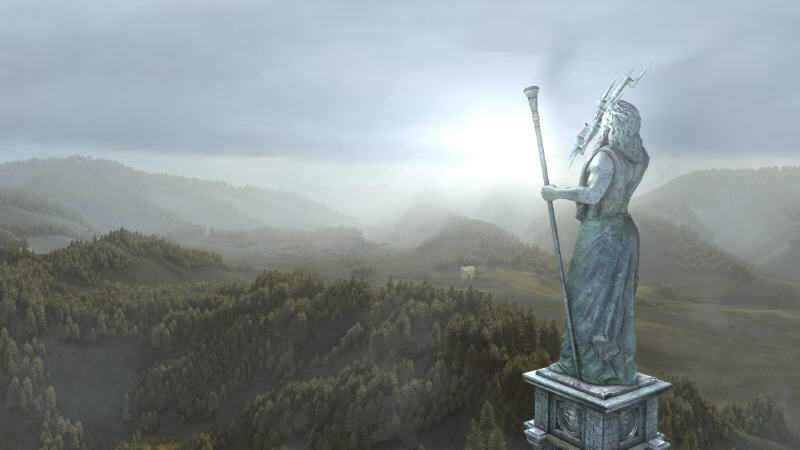 The final chord of this history unveiled with a standalone add-on – Fallen Champions (2011) released last September, while serving as a bridge linking the original history to the new events. It is really interesting to note that Neocore has always been actively communicating with its audience taking into account the wishes of the community. Many requested features were implemented in the first update for the King Arthur: The Role-playing Wargame. Amongst them you could find a new difficulty mode for beginners or an option to weaken the archers just in case you didn’t like them being too powerful until you reached armored knights units. Nearly two years were required to create a sequel, while several additional specialists were employed by Neocore to make the new game even bigger in scale. 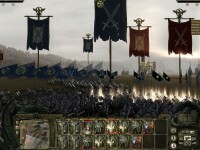 King Arthur II: The Role-playing Wargame is once again going to charm the Fantasy grand strategies fans. 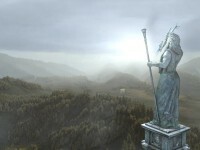 The in-game plot unfolds in a main campaign continuing the story of the wise ruler named King Arthur. It is important to emphasize that this legendary figure is not a playable game character, but with your help will direct the actions of his loyal knights. This time all the writers at Neocore once again dived into the world of the Celtic mythology and added some Dark Fantasy touches to it. The premise sticks to the fatal wound received by Arthur and its consequences to himself and his kingdom. 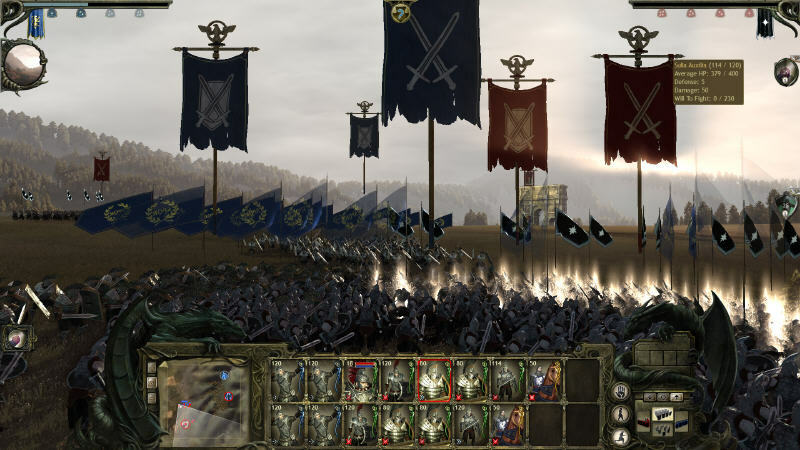 One of the main riches King Arthur II: The Role-playing Wargame is its well-developed story, and we will not tell you more about it not to spoil all your future fun, and instead let us focus on the intriguing mini-campaign, which is an Opening Act or Prologue to the main game, while exceeding the duration of its short counterparts from the Total War (2000-2011) series. This particular story is referred to as King Arthur II: Dead Legions and tells of another Britannia region with own heroes. You can get this separate expansion as an exclusive Pre-Order bonus. The protagonist of this Prologue chapter is a Roman nobleman called Septimus Sulla. Serving his matters and family on the island of Britain his future depends on the events unfolding in the surroundings of the famous Hadrian wall constructed by a Roman emperor – Hadrian (76-138). This fortification was build to protect the Roman provinces in Britannia from the northern tribes including warlike and bloodthirsty Picts, who waited long enough to drive the Latin conquerors out of their lands. Events in which you will be able to participate further in this Prologue chapter of King Arthur II: The Role-playing Wargame craft a prequel to the main plot, but this campaign is also able to teach you some nice tricks with its Tutorial functions. Roman Britain is inhabited by five other Roman noble families, including a trading clan of Severus, landlords of Carcalla, military Quintus faction and some fellow patricians of Messala. By the way, all these names have their historical prototypes. Septimus Sulla himself represents the sixth noble family, and his father in the past held his own and quite a respected place in the local Senate. However, another offensive raid carried out by the Picts in the north forced the remnants of the Roman army in Britain to act more agressively. In a new Senate meeting, your hero Septimus here openly declares his desire to participate in managing regional policies. Soon enough you will learn all the tensions between the clans struggling for power. Family leaders are waiting for any chance to harm their political opponents. Septimus will face a tough challenge, while picking his allies. Any decision you make here can affect the relationship with other factions, and preferring one Roman family over another will make you some new enemies. In its heart, the strategic gameplay of King Arthur II: The Role-playing Wargame remained unchanged. 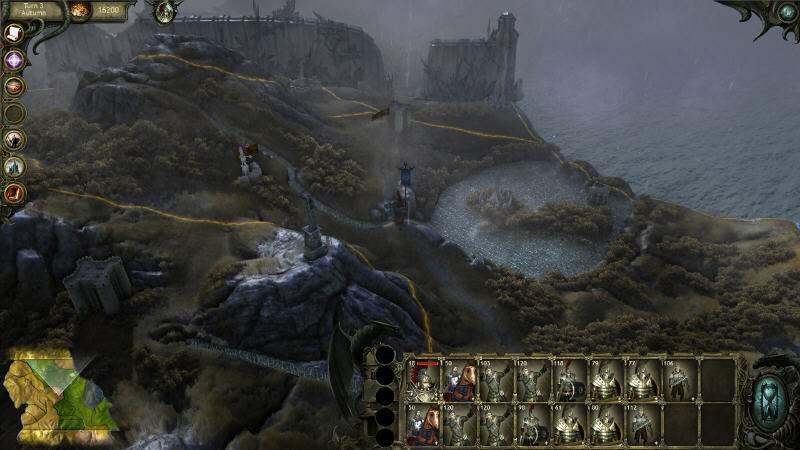 In other words, you will be traveling on a large map with your heroes, and the main character in this mini-campaign of King Arthur II: The Role-playing Wargame is created based on the selected answers in the Introductory part, which deals with how Septimus has survived the battle, where all others died. The Tutorial mode is very detailed. In addition to the interactive tips requiring to commit certain actions, there is a built-in guide with pictures and videos, as well as a colorful Manual with 56 PDF-pages. It is very well-written, though lacks information about the available skills and spells. Maybe it was left out to keep you even more intrigued. Three hero classes might already be familiar to you. Your character can be a Champion a Warlord or a Sage. This choice directly influences possible skill trees for development. The number of economy resources in the King Arthur II: The Role-playing Wargame was reduced just to one – Gold. Along with the absense of Food the options for taxation management are also nowhere to be found. Now you can become richer through gaining loot in battles, via diplomatic actions, quest rewards and putting artifacts on sale. It somewhat show that Septimus Sulla is not a king, while still following the orders issued by the Senate. A variety of great quests will start flowing towards you really soon. 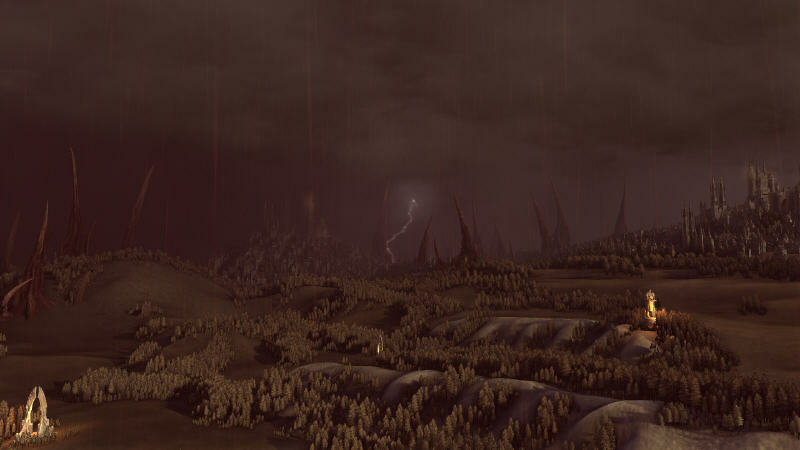 The Senate will send Septimus to deal with the Picts threat in the north, where they besieged Carcalla luxury villas. A few turns to the East from there a local tribe of Vikings is leaving. While staying neutral, their territory holds an Artifact Forge, wha is an important location to control. At the same time the Quintus family population suffers from the deadly disease. All these short or long stories will be solved with your decisions. As usually, these missions are presented text format with provided descriptions, nice illustrations and even some voiced dialogues. 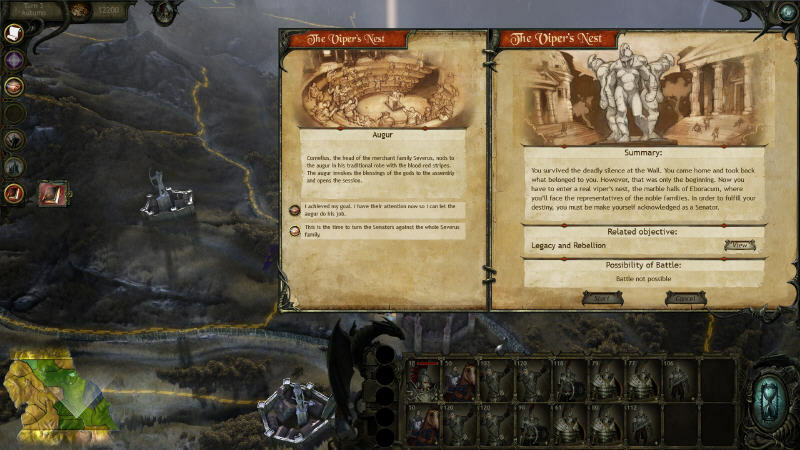 Varios answer choices reflect your chance to get more reward, improve or spoil your standing with different factions. There is even a chance for going to a battlefield, if diplomatic options fail. Some possible decisions are marked with having unknown consequences. In King Arthur II: The Role-playing Wargame you will see their result, only if you dare to pick them. As a rule, you can not please everyone, and the better you behave towards one of the clans, the worse it you will be treat by his rivals. That is a strong foundation for Civil War reasons. For example, there is a coup in the works inside the Messala clan, where a son is looking for an opportunity to come into power overthrowing his own father. Here you can solve it differently with helping to catch a traitor, supporting the revolt or taking part in it secretly, while reaching the desired result with no one suspecting your contribution to it. The quests we have already seen are really interesting to read and take part in. Though we would enjoy seeing bigger fonts, since sometimes these tiny letters in high resolution at times are putting pressure on the eyes. The compact text areas meanwhile are trying to save more space of the screen. 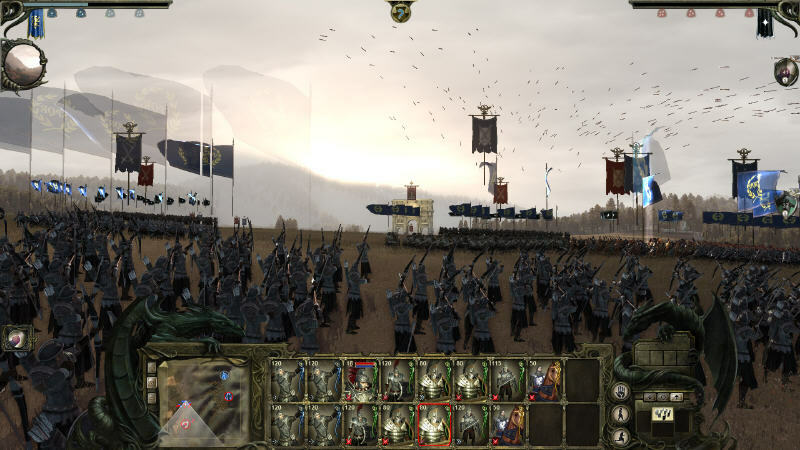 In this strategy entitled King Arthur II: The Role-playing Wargame more often than not you are not forced to complete any tasks and can take your time with them. However, there still might be some ahead requiring your reaction as soon as possible just like it was in the first game or even those that are obligatory before moving on. In winter the armies don’t move again, giving you more time to work with development of your provinces and selecting new skills and abilities for your heroes and units. Another important observation concerned the economy role, which was toned down in comparision with the previous game. The upgrades path is mainly serving the strength of your army and its heroes. 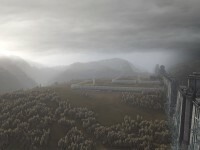 Depending on the specialty of the area (Castle, Town, Village), you can place various buildings there to acquire some unique bonuses for the governors, heroes and soldiers. 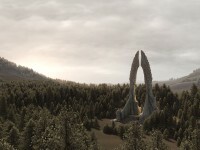 Each land brings to you some Lore points and features a few slots for local improvements with new buildings. In the game you have to do some research to unlock more powerful upgrades. All the knowledge there is divided into several branches filled with enticing options. Units receive their experience in combat and get automatically converted to the more advanced regiments in their approprite tiers. In addition, you can distribute skill points to boost certain skills and choose abilities for the every 5th Level. 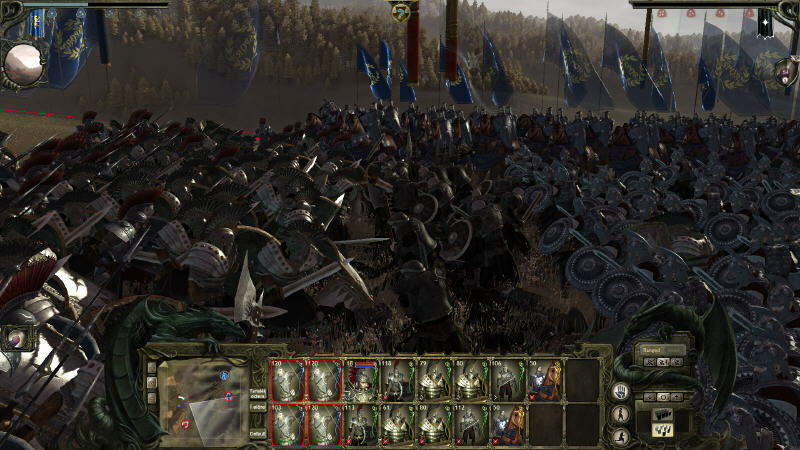 All of this will help you to create a strong army, where even two Spearmen divisions might serve different functions. 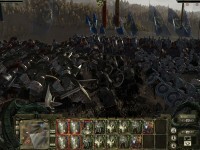 Among the available unit types you can find infantry, where the archers take their special place, then cavalry and even various fantasy creatures. On the map there are many useful objects: artifacts’ forges, monster lairs and such. You might even recruit some of these to your bidding if your standing on the Morality Chart is acceptable by these creatures. There is also a Forging or Crafting system implemented in King Arthur II: The Role-playing Wargame. With this you can use your magical ingredients or other artifacts to combine them into something more poweful. It is very important, what first part you choose, since it influences the type of the created item. Though some additional luck might be required as well. Other interesting innovations are available in the Diplomacy section. If you get an ally, you can run a joint military excercises making your army more experienced, for example. Trade pacts and marriages present an indirect way to build relationships with your neighbors. Not always it will help you to reach the desired outcome, and the times for great battles will come. Probably, the flying units here is a wonderful new addition. In King Arthur II: The Role-playing Wargame these creatures can move quickly, fly over any obstacles and attack enemies on the ground. Though vulnerable to ranged attacks then can even get some passive damage from foot soldiers, which are defending themselves from an aerial strike. Your opponents will gladly use their monster creatures and big bosses to harm your army. Your usual Spellcasting will require some adaptive changes as well. The sequel here arrives with another amazing novelty called Magical Shields. Each warring side gets this one to reflect the ability to resist opponent’s magical attacks. Think of this as about a protective cover winning you some more time before the enemy spells strike down on your forces. Magical Shields absorb damage from spells, but they can lose their strength over time and attacks, and you will have to rush for victory, if you are fighting with a powerful mage. 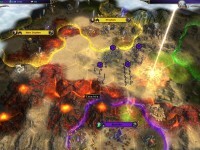 Even more actively with this you will engage in local battles for the control over Victory Locations, which represent a monument or a nice defensive position granting a special bonus, which might increase your war resources, help your units or use a powerful offensive magic for free of charge in King Arthur II: The Role-playing Wargame. In such grand strategy games, where tactical battles play such a major role, it is very important to have a good and challenging AI. We have already experienced its wrath, and, yes, it has become even more cunning and dangerous than before. Four difficulty modes will directly affect the advantages and handicaps that AI gets on the battlefield. We have fully tested the Normal difficulty, where the line of fair justice is drawn. Then we noticed some interesting actions and maneuvers carried out by the virtual generals. It was very remarkable for us to engage the large force of Picts in the north combined of infanty, archers, giants and some flying creatures resembling Gargoyles, but here such a unit is called Talonfolk. We positioned our forces on the edge of the forest ready to engage. There is a big deal of possible orders, formations, special abilities and heroic skills to aid you in battles of King Arthur II: The Role-playing Wargame, though you have to choose them wisely and activate everything at the right moment. Cooldown times won’t let you rely too much on this special bonuses. So in that particular battle we started describing above, our enemy built up his formations and sent ahead his giants. While being busy fighting them, we didn’t notice, how flying Talonfolks striked our army from above targeting archers and scattering them away. It is a completely new strategic feeling, where the second line covered by your infanty isn’t a safe heaven anymore. Facing a barrage of arrows fire from our opponent, we noticed, how cleverly it targets the weakest spots in our lines making them useless after suffering heavy casualties. The enemy made a next wise move distracting us with moving his hero secured by strong bodyguards. This special characters can withstand some big damage before falling apart. We tried to encircle the virtue’s leader, but it was a mistake, since it made our army surrounded from three sides. This fast-paced combat in time will teach you to use the Pause command to observe the surroundings and try to predict the next move of your foe. The mini-map clearly showed the possible defeat, and each of our remaining units were fighting with those, who most likely could cause serious harm to it. There was nothing left to do, besides ordering the full retreat and loading a previous Save Game. That is one of our biggest impressions we have got with this Preview build of the King Arthur II: The Role-playing Wargame. By the way, in case of death of the protagonist the game in mini-campaign ends, since your armiers are commanded by Septimus Sulla himself, in contrast to primary campaign, where the supreme leader of the faction will be out of reach. In general, the AI has walked even more steps further to make you worry that incorrect decisions made on the battlefield might become a fatal irreversible wound to a possible victory. 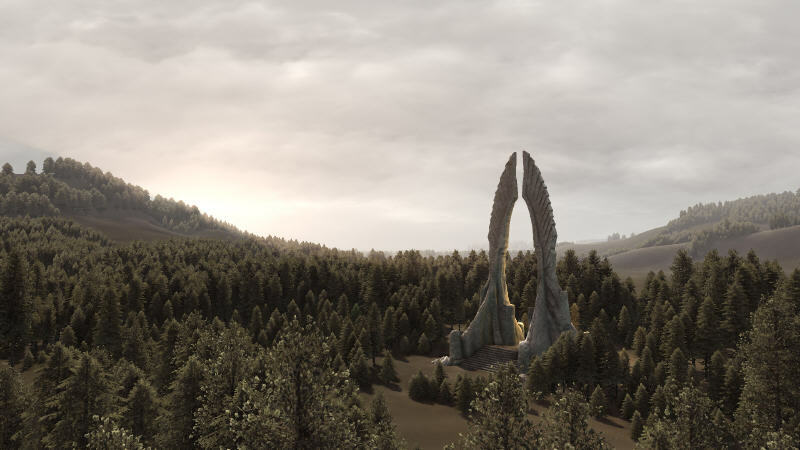 In terms of visuals, we did notice improved animations, plenty of special effects and a stunningly beautiful 3D-map of all the available lands in the resion. At times it looks like an Action game being observed from bird’s-eye view. There are forests and high mountains. By high we really mean them being high, not just usual hills icons some other strategy games usually present. Neocore has seriously upgraded its Coretech 3D technology, and it is suprisingly pleasant to look at. As in other Neocore’s games you will also see some great artwork here created by really talented artists. Dark warriors and Fantasy princesses are imagined in a near-photorealistic quality. 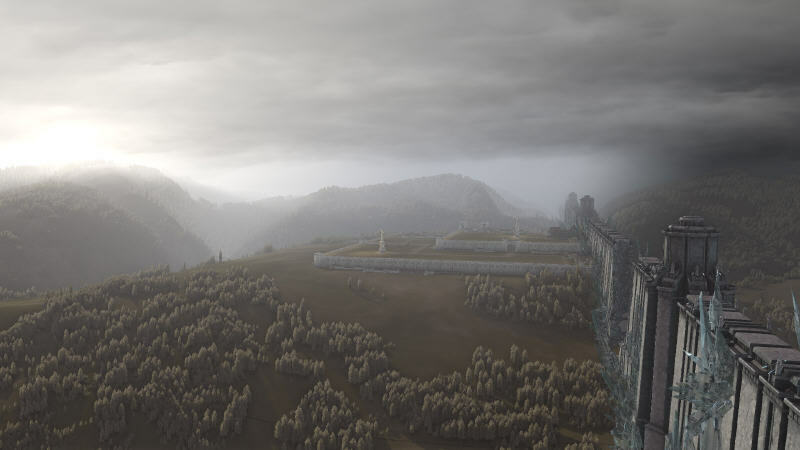 Such images in King Arthur II: The Role-playing Wargame would benefit any mythology museum out there. The only drawback here is the lack of the in-game story cutscenes. The introduction we have seen was presented through a series of comic style drawings, but keep in mind that this is just a Preview build, and we don’t know how the story might be supported in the main campaign. Any new quest screens also contain some black and white sketches serving as illustrations. We like sound effects, and, especially, the soundtrack, though it has got some more mature and dark style. Orchestral arrangements is a good addition to the global map, where you will have to spend time being involved in various activities, and narraor’s VO helps to enrich this atmosphere. Though it is too early to speak about the soundtrack as a whole, since we listened just to some samples of it, but really enjoyed it. No traces of Multiplayer were located in the mini-campaign of King Arthur II: The Role-playing Wargame. There will still be some free Skirmish battles against the AI, where toy can recruit an army with up to 18 units and rush to a chosen map. The main value will stay with the campaign, since there besides the battles you can also develop your heroes, manage aspects of domestic and foreign policies, solve quests and go searching for the artifacts, while trying to keep up your gold balance positive. The size of the campaign map is also remarkable, since it is several times bigger than its predecessor from the first game. King Arthur II: The Role-playing Wargame shows notable improvements on many fronts, while still keeping the original charm. Our play with the sequel’s Prologue left us with a burning desire to try out the full game, when it comes out on the 27th of January, 2012. This game is filled with many features that might please the fans of the genre, while the story is very rich in its details and the AI is really skilled in offensive maneuvers. Related News: Dead Legions / Demo / Questions / Website. Read More: FAQ / Interview.